With the pending retirement of Kobe Bryant many people have been asking if he was better than Michael Jordan. From the perspective of pure scoring production we can easily compare their peak values. Jordan's peak is easy to recognize. From 1988-1991 the Bulls shooting guard ran off four straight seasons of at least 300 'Points Above League Average'. These are four of the top sixty greatest scoring seasons in NBA history. Kobe's peak scoring seasons are a little harder to find but his absolute best was 162 'Points Above Average' in 2007, the year after he averaged 35 points per game. 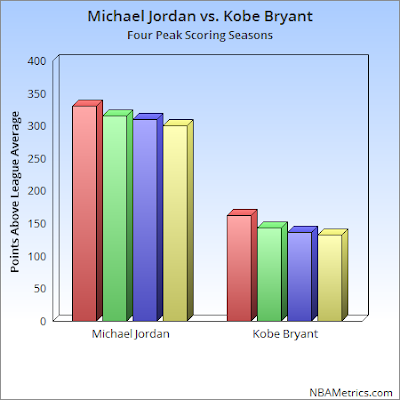 The chart above shows the difference between Jordan's all-time greatness and Kobe's super good scoring years.